Fungi as food - Agaricus brunnescens, the supermarket mushroom. Fungi as food - oyster mushroom, Pleurotus ostreatus - wild. 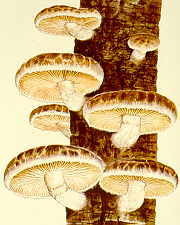 Fungi as food - Pleurotus ostreatus - domesticated. 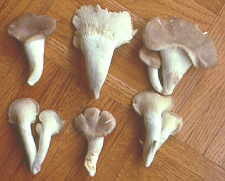 Fungi as food - Pleurotus ostreatus - from farmers' market. 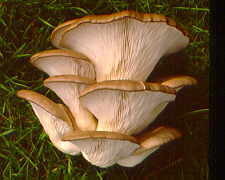 Fungi as food - Pleurotus ostreatus - gift from grower. 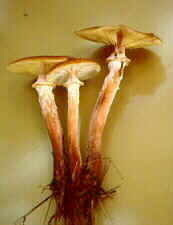 Fungi as food - shii-take or xiang-gu, Lentinus edodes. Fungi as food - Lentinus edodes fruiting on a sawdust block. Fungi as food - the paddy straw mushroom, Volvariella volvacea. Fungi as food - Volvariella volvacea - young specimens. 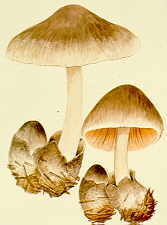 Fungi as food - Volvariella volvacea label. 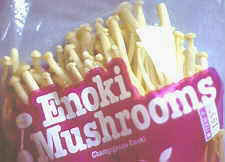 Fungi as food - enokitake, Flammulinas velutipes - etiolated basidiomata as grown in culture. 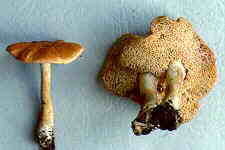 Fungi as food - nameko, Pholiota nameko. 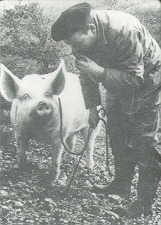 Fungi as food - truffling pig of yesteryear. Fungi as food - truffle dog of today. 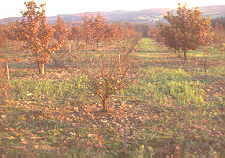 Fungi as food - a truffle orchard in France. 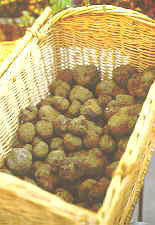 Fungi as food - a basket of black truffles. Fungi as food - René Pomerleau sniffing a black truffle at the truffle market in Carpentras, France. 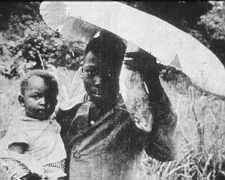 This specimen went for US$60 in 1985. Fungi as food - poster for an Italian truffle fair. Fungi as food - Truffles - How many other fungi have their own International Congress? Fungi as food - pâté aux truffes. 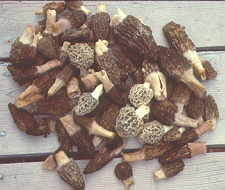 Fungi as food - morel festivals in Michigan. 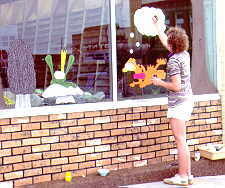 Fungi as food - morel cartoonist in Boyne City, Michigan. 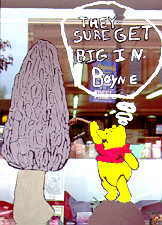 Fungi as food - morel cartoons, Boyne City. Fungi as food - morel hunters under the gun, near Boyne city. 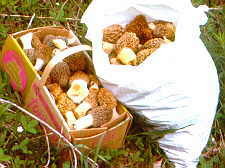 Fungi as food - the morel harvest. 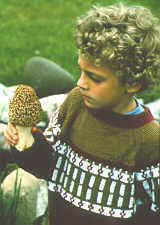 Fungi as food - 'My Verpa's bigger than yours' - Boyne City, Michigan. 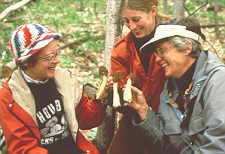 Nancy Weber, author of the best book on morels, is on the left. Fungi as food - Clint and Kelly Kendrick in 1976 with examples of the best collection of morels we ever made, around recently dead elm trees near Ottawa, Ontario. 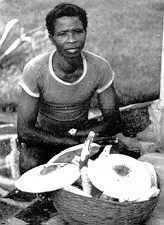 Fungi as food - This was it - those were the days! 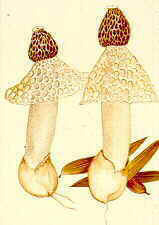 Fungi as food - Only in your dreams. 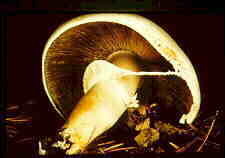 Fungi as medicine - ling-chi or reishi, Ganoderma lucidum, as grown in Korea. 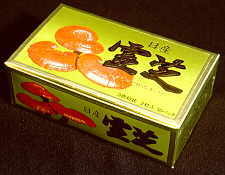 Fungi as medicine - gift-boxed ling-chi. Fungi as food - Boletus edulis (cep, steinpilz, porcini). 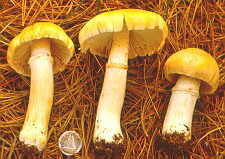 Fungi as food - matsutake, Tricholoma magnivelare, grade 3. Fungi as food - chanterelles, Cantharellus cibarius. 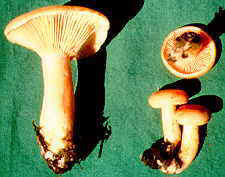 Fungi as food - Lactarius deliciosus. 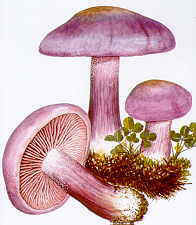 Fungi as food - blewit, Clitocybe (Lepista) nuda. Fungi as food - fairy ring mushroon, Marasmius oreades. Fungi as food - shaggy mane, Coprinus comatus. 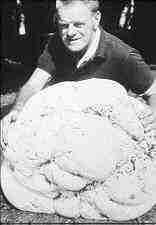 Fungi as food - giant puffball, Langermannia (Calvatia) gigantea. 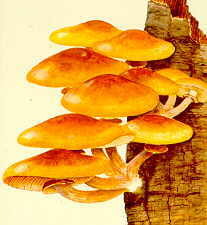 Fungi as food - honey fungus, Armillaria mellea. 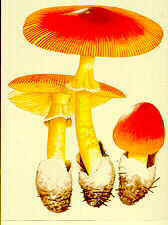 Fungi as food - Amanita caesarea. 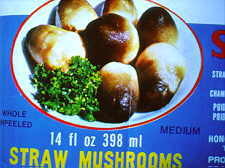 Fungi as food - Termitomyces for sale. 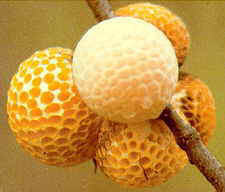 Fungi as food - Cyttaria. 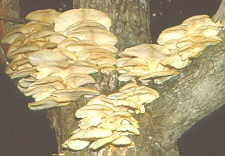 Fungi as food - sulphur shelf, Laetiporus sulphureus. 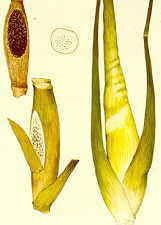 Fungi as food - sweet tooth, Dentinum repandum. 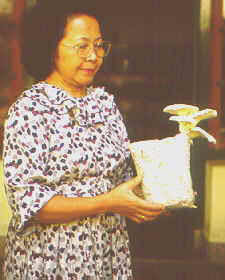 Fungi as food - caulifower mushroom, Sparassis crispa. Fungi as food - the gypsy, Rozites caperata.